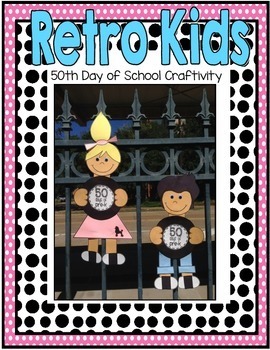 Retro Boy and Girl 50th Day of School Craftivity with Optional Necklace and Hat! 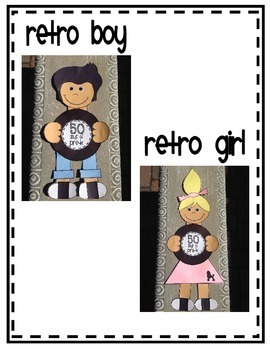 Celebrate the 50th Day of School with this fun Retro Boy with his tight rolled jeans and slicked back 50s hair or a precious Girl Craftivity complete with poodle skirt and hair tie-both wearing their precious saddle oxfords! The Retro Kids are holding records that read "50 Days of..." with different grade level options! -2 face outlines: 1 with eyes and 1 blank with options to draw your own eyes or add Wiggly Eyes! -Master copies of all pieces with color indicated and multiple pieces per page to conserve construction paper. -Center of record can also be decorated and used as a necklace for younger students to wear (just add yarn) or added to strips of paper to make a hat! Please let me know if you have any questions, comments or suggestions!! I would be happy to personalize to record for you if your grade isn't listed!